Rick Barker is the President and CEO of the Music Industry Blueprint in Nashville, TN. He is a manager, entrepreneur, author, and consultant focusing on the recent changes in the music business. By sharing his experience and insider tips, he helps his clients understand the music business and fast-tracks their steps to success. While those things describe his business life, the titles that he loves most are the ones which describe his personal life: Sober, Christian, Husband, and Father. Rick ... Más informaciones grew up in Alabama and was raised by a single mom. Growing up with very little in way of money and resources, Rick developed a work ethic and learned to hustle at the age of 12. By the age of 14, he was helping his mom financially support his brothers and sister. Rick was not a fan of the traditional education system. He found himself doing just enough to get by in the classes that didn’t interest him, yet excelling in those that did. At the age of 17, his life changed dramatically when he moved to California to live with his dad. He got involved with the wrong crowd and ended up quitting high school. Later, he found himself addicted to drugs and living homeless on the streets of LA. On April 4, 1989, after battling a cocaine addiction Rick got on his knees and prayed that God would let him die. Yet, God had other plans for Rick. These plans included sobriety, pursuing his dream of being on the radio, marrying his wife (Jill) and having two great children (Brianna and Logan), and one day meeting and managing Taylor Swift. All of these trials and tribulations influenced him to become the man he is today. Rick Barker’s motto is “Your Past Does Not Define Your Future” and he is living proof of that. In this podcast, Rick teaches artists how to treat their art as a business and become an attractive partner to a record label. With major changes in the music industry and digital world today, record labels expect artists to build their online presence and fan base, become great songwriters and performers, and ultimately create their own buzz. 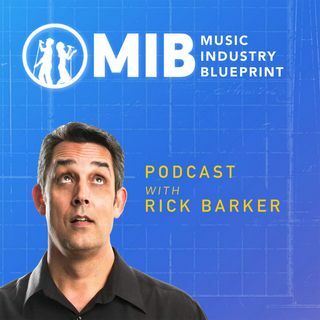 Through interviews with other experts in the music industry, and his own insights Rick shares the mindset, tactics, and principles you need to take your music to the next level. Episode 115: Comparing Life and The Music Business to March Madness! Episode 112: She is changing lives and making money, this is how it is done!